Keep your Samsung Galaxy S8 Plus' screen in pristine condition with this Olixar Tempered Glass screen protector, designed for full coverage of your phone's screen. This design leaves space for a case and comes with an install tool for perfect alignment. Screen protector completes the protection of my excellent Galaxy S8+. Combined with Otterbox to give a rugged all round solution to replacing expensive screens! I have no problems with the product, the application was really fast and easy to. I have had no problems with the screen protector so far, I can't even notice it's there. Very pleased with my screen protector. I was very skeptical at first because not many of them seem to fit right for the phone after trying multiple brands. Once I had the guide tool to use it seemed like the fitting on this brand was little more accurate then others. Will buy this again if ever needed. 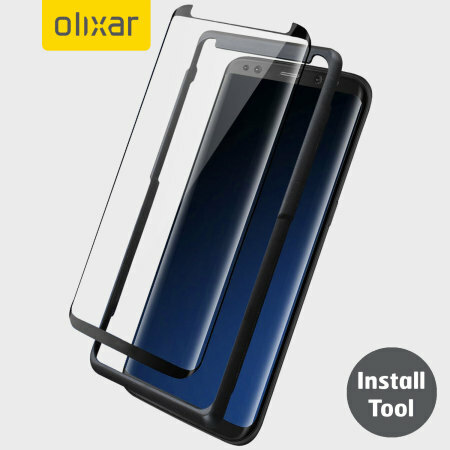 Olixar EasyFit Screen Protector and X-Duo Case for S8+. First impressions very good. Combination looked great and protector went on quite easily. Concern - in the hand there isn't much grip on the case and I'm extra careful how I handle it. Fibres on back of case starting to show "rubbing." Dropped the phone from a bedside table onto a wooden floor - about 60cm. Top right-hand corner of the case had a mark and the top right corner of the protector chipped. I was actually pleased at first - it did it's job to protect the phone. Concern - The chip has extended to 4cm crack. There is a new 2cm scratch/crack in the middle of the screen that seems to be growing. I bought the protector expecting it to last a long time and look good. May need to replace it within a few months. Thought it was 9H tough and a screwdriver wouldn't scratch it?? I would probably buy again to see if it was just a one off experience. It does look good but shows finger prints a lot - have to wipe the protector frequently to make it look like new. If you follow the instructions, easy to fit. Not 100% screen coverage, but enough. Works perfectly with my Otterbox Symettry Case. Easy to install and the tool is awesome. It aligns perfectly and instantly with it. Fully compatible with my clear cover and now my S8+ is completely covered and protected. Highly recommend it and thanks mobile fun for the YouTube video which helps a lot with the tips you give. This is honestly the best screen protector you can get for your Samsung galaxy s8 plus. It fits the screen perfectly and it's easy to apply. When it's applied you hardly notice it's on your screen. Excellent product. Very easy installation. No Problems. The only con would be finger smudging. However to be expected. Easy to wipe off. Gets dust nd things trapped under it. Sorry to hear you are not happy with this screen protector. Each Samsung Galaxy S8 Plus phone will have minor differences in the curvature of its screen due to the varying tolerances of the manufacturing process, which can cause issues for all glass screen protectors unfortunately. This can sometimes mean dust can start to attach to any visible glue on the very edge. Very good screen protector easy to put on with the kit. Quality item, very easy to fit, particularly with the Install Tool which is well worth the extra money. Once fitted, the sensitivity of the original touch screen remains. This product is a awesome fit, easy to put on, works good with cases. I wanted to find a glass screen protector for my curved S8 that really worked! I found a video and this particular screen cover was recommended, the price was decent to i decided to give it a try!!! Not only was it easy to install but it's compatible with my case as well...I would definitely purchase again,and I sent my friend a link to purchase this product as well!!! Easy instalation, touch screen work good..